GrowBinary is proud to be an international binary options innovator designed to ensure a private investment for all customers. We provide traders with an excellent trader experience in terms of security, features, tools, and education. We commit to excellence in providing a trading platform that can be used for private and institutional investors. Our staff is here 24/7, with professional brokers guiding traders every step of the way. Registered under the brand name of Growell Capital, authorized and regulated by the Cyprus Securities and Exchange Commission (“CySEC”) as a CIF limited company with a license number 214/13, operating under the EU Markets in Financial Instruments Directive (MiFID). Deposit/ Withdraw: VISA, VISA Electron, Maestro, MasterCard, BankWire, Neteller, Skrill, MoneyGram and Western Union. Headquarters: 17 Spyrou Kyprianou Ave, MBC Business Center, 3rd Floor, 4001 Limassol, Cyprus. Join GrowBinary and benefit from our unbeatable 100% Welcome Bonus. Make your first deposit, claim your bonus, and enhance your trading power from the first trade. Fill the registration form and START NOW! Last edited by GrowBinary Support; 05-31-2015 at 10:35 PM. 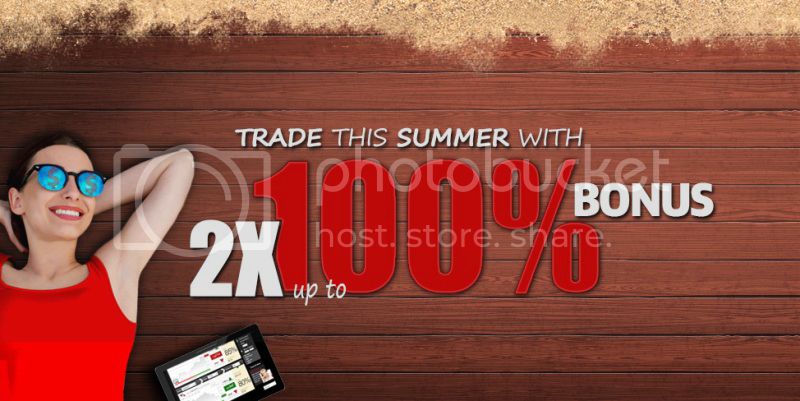 Enjoy the hot summer trading season with the 2x up to 100% Bonus! Here at GrowBinary, we want to enjoy and celebrate the long awaited summer time together with our valued clients. This is why we have decided to offer an exclusive promotional offer with a Bonus up to 100%. Yet, the summer dream doesn’t end there. Our clients are entitled to receive this generous Bonus offer not once but twice! How can you participate in the Hot Summer Promotion? Be quick, because just like the summer, this offer will only be around for a limited time. In an attempt to spread the good memories, GrowBinary will be extending its popular 2x up to 100% Bonus promotion until the 20th of September. Yes, that’s right. Thanks to the striking success of this promotion and in response to increasing requests from clients, GrowBinary decided to end traders’ summer with good memories. Whether chilling on a beach or a mountain, all traders can open an account to win a double welcome bonus and end their summer in the best way possible. When you open a new GrowBinary account and make your first deposit, we will reward you with a special Welcome Bonus up to 100% to ensure that you get off to a strong start. Our new Safe Start Promotion is available to all new clients upon registration, meaning that you can enter the markets to trade with confidence and security. To claim your 100% Rescue Bonus, simply get in touch with your Personal Account Manager and they will ensure that the appropriate bonus funds are credited to your account very quickly, enabling you to jump straight back in to the markets as soon as possible. Last edited by GrowBinary Support; 09-21-2015 at 07:30 AM.